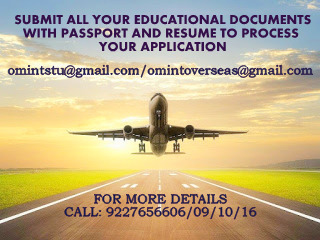 OM VISA Consultancy - Global Immigration, Students, Visitor, Business & Work VISA Consultants: Apply in West Texas A&M University, and make your future bright with the help of Om International the leading visa consultancy in Gujarat. Apply in West Texas A&M University, and make your future bright with the help of Om International the leading visa consultancy in Gujarat. West Texas A&M University, also known as WTAMU, WT, is a public university located in Canyon, Texas. The university was established on September 20, 1910, and was originally known as West Texas State Normal College. West Texas A&M University is ranked #91 in Regional Universities West. Tuition Fee : $22,047 p.a. GRE or GMAT – Not required for GPA of 3.0 and higher for some majors. Tuition Fee : $14,132 p.a. Note : Transcript evaluation is required for all Graduate Degree Programs. Labels: STUDENT VISA, study in US, study in West Texas A&M university, US student visa.